According to ThinkSecret, Apple has developed an RSS reader for the iPhone as an AJAX/Web 2.0 application at http://reader.mac.com. Apple has developed a web app at reader.mac.com that will bring RSS feeds to the iPhone. Users will be able to add the addresses of news feeds and check on headlines through the Apple-designed RSS aggregator. 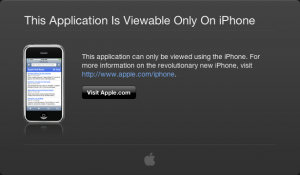 Readers have already visited the site with spoofed iPhone useragents and are only greeted with a blank page. It appears Apple's RSS Reader application isn't yet active for the public.